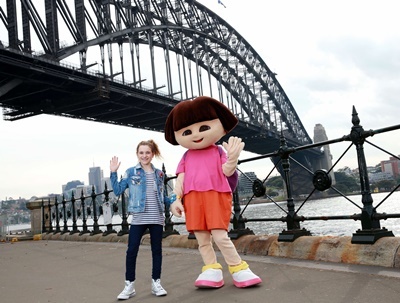 One of the world’s most loved adventurers, Dora the Explorer, is exploring new territory as the first Nickelodeon character to be crowned Godmother of a cruise ship, P&O’s Pacific Explorer. Pacific Explorer is set to have the ‘slime of her life’ when Dora christens the ship at a naming ceremony at Sydney’s Overseas Passenger Terminal on Sunday July 2. Pacific Explorer is fitted a range of new activities including the longest and wildest waterslides at sea, an interactive water park, P&OEdge Adventure Park – with activities such as zip lining and rock climbing, an outdoor Big Screen, and barefoot lawn bowls. 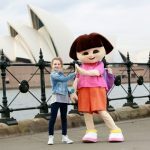 “In keeping with the ship’s family appeal, it felt only fitting to invite a much loved household name like Nickelodeon’s Dora the Explorer to be Godmother. She’s a family favourite, enjoys adventure and trying new activities, and is a perfect fit to help showcase all that our ship has to offer”, said P&O Cruises President Sture Myrmell. “We’ve taken the winning features of our existing ships and added a whole new layer of excitement with some big wow moments like the waterslides and the bowling green and the elegant new small bar The Bonded Store, featuring a cocktail list created in partnership with Sydney-based award-winning Archie Rose Distilling Co, as well as whisky and gin-making classes”. Vice President and General Manager of Nickelodeon Australia and New Zealand, Ben Cox, is thrilled to help host the festivities at P&O’s Nautical Nonsense with Nickelodeon Welcome Party. Pacific Explorer’s cruises include an 8-night, A Taste of New Caledonia cruise departing Sydney on July 20, 2017. Fares start from $835** per person quad share on the 3 x Free Sale.